Emory:: Let's not lie, Steve. Let's level with America. Stephen: We can't level. We're in advertising! It takes a lot to make me go, "Yeah!" inside a movie theater, but in the opening minutes of Dudley Moore's zany 1990 comedy Crazy People, a certain sequence moved me to such a point. At the time, cell phones were becoming all the rage in cars and for the life of me, I couldn't understand why. My feeling is there's enough in the way of distractions in and out of a typical automobile, and unless you've got the likes of Christina Applegate or Jennifer Anniston in the front seat, both hands should be planted firmly on the wheel (and don't get me cranked about this disturbingly developing trend of dashboard compatible DVD players). Trouble is, my sentiments about being a responsible driver weren't shared by tech geeks and businessmen who always had one of those newfangled contraptions within earshot. So, when the suddenly un-cuddly Dudley takes matters into his own hands, grabs that mobile phone off a generic businessman and hand-catapults it into the East River, it's all I could do to not stand up and applaud. Years later, my minority stance on all things mobile communication hasn't wavered. With clients stacking up like endless pancakes at an all-you-can-eat breakfast, and inspiration at an all time low, the stressed-out Brit, working in New York as an slogan writer goes mental (but in a creative way) and turns in some ad copy that truly lives up to the term Truth in Advertising. After submitting the likes of "Volvo: They're Boxy, But They're Good", co-worker Stephen Bachman (a pre-Mad About You Paul Reiser) thinks just maybe it's time for Emory to take a medical sabbatical. Besides, there's no way pushy boss Charles F. Drucker (J.T. Walsh) is going to approve Emory's projected Metamucil pitch ("It Helps You Go To The Toilet. If You Don't, You'll Get Cancer And Die") among many other anti-Madison Avenue gems. That is until miscommunication causes virtually all of Emory's unflinchingly truthful ads to surface. Instead of the expected firestorm of complaints, his creations become the talk of the industry. Clients, from airlines to movie studios, are raking in the moolah thanks to his attention-getting campaigns. But the comeback king of the agency doesn't want to return to the office; the sanitarium life suits him. Actually, like any "normal" guy, he doesn't want to leave Kathy Burgess (Daryl Hannah), a flaky blonde resident with a little girl voice whose only setback is that she's afraid of everything. But with his insurance about to be cut off, Emory drafts his fellow inhabitants as his support staff. Do Emory and his nutty sloganeers become cover material for Advertising Age? 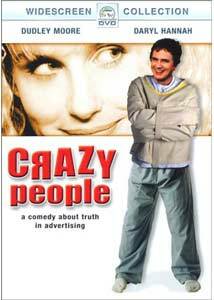 In spite of its shortcomings (lack of character development, a little too much forced drama in the second half), Crazy People holds up surprisingly well despite its age. Although the bogus ad campaigns justifiably remain the big drawing card, a praiseworthy cast deserves note. When given the right material (10, Arthur, Micki and Maude) Dudley Moore could be gut-bustingly funny and his slightly tempered but still effective comedic skills are put to good use here. Hannah's sweetly shy persona is engaging, Reiser reminds us of what a good supporting actor he was before sitcom-land came calling, and the late, great J.T. Walsh is snake-in-the-grass perfection as the big boss man. Equally memorable despite smaller roles are noted character actor David Paymer (as lovable, one-word George), Alan North of Police Squad notoriety, and Bill Smitrovich as but three of Emory's memorable fellow patients. Image Transfer Review: Crazy People almost knocks it out of the park with near-perfect visuals. Accurate colors and pristine black levels rank among its strong points; only a tad more softness than I would have preferred keeps it from flawless honors. Overall, exceedingly impressive and a fine example of how to do a catalog offering right. Audio Transfer Review: Par for most comedies, the 2.0 and 5.1 mixes aren't much to write home about, but Cliff Eidelman's cartoon-ish score is nicely showcased, particularly on the latter option; it has more presence, especially in the lower frequencies. Extras Review: No trailer, no bonuses. Dudley Moore's last funny movie gets a well deserved digital rebirth courtesy of Paramount. Although featureless, its above-average transfer and sound make it a worthy purchase.